Your attic is one of the last things on your mind when it comes to finishing. After all, no one is going to be hanging out in there, let alone sleeping. So why spend the money to insulate your attic? The solution is simple—insulation keeps your home warm in the winter and cool in the summer. Every part of your home works together, from the basement to the main floor, to your attic. If there’s any air to seep from cracks or anything, it’ll seep, increasing the need for energy to heat or cool your home. Insulating your attic can take 10 to even 50 percent off your heating bill, and it can be a simple project you do on your own over the weekend. 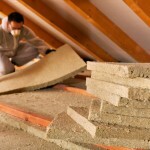 And there are different options for insulating your attic: loose fill or batt (blanket insulation). Loose fill insulation is where insulation fibers are packaged in bags and blown into place to the desired depth, which works best for attics with irregular joint spacing, obstructions to work around, existing insulation, or low-clearance attics. The types of material for loose fill include fiberglass (recycled glass or sand melted and spun into fibers), cellulose (recycled post-consumer paper treated for insect and fire resistance) or mineral wool (fibers from rock or recycled slag from blast furnaces). Batt insulation comes packed in rolls of various thickness, usually 16-24 inches wide, which work best for attics with standard joint spacing, few obstructions, and sufficient headroom. The types of material for batt insulation include fiberglass, cellulose, mineral wool or cotton (fibers from recycled denim cloth). Move your storage elsewhere—the plywood floor that’s present in your attic so you can store your holiday items and other things will have to be removed in order to accommodate the insulation. Seal air leaks to prevent heated or cooled air from escaping outside. Make sure to check around attic windows; around pipes, wires, exhaust fans and ducts; and around chimneys and flues. Fix any roof leaks, and check for any water stains or issues that might happen. You don’t want your insulation getting wet. Make sure all light fixtures are protected from insulation—insulation touching a heat source like a light fixture is a fire hazard. Make sure all exhaust fans and vents are directed to the outside of your home—again, moisture is insulation’s biggest enemy. And while the goal is to seal up your attic for better comfort, make sure you don’t cover up soffit vents in your roof, nor allow insulation to touch the roof’s underside. You want to allow for airflow to help keep the roof cool and prevent ice dams. 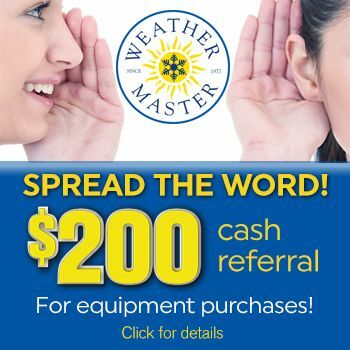 Take your time and consult with the professionals at Weather Master. We offer a full range of insulation products and we can help you tackle the task!